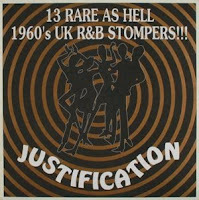 FuzzyWasabi: Justification - 13 Rare as Hell 1960's UK R&B Stompers !!! Justification - 13 Rare as Hell 1960's UK R&B Stompers !!! Last Volume of this series in my possesion. Anyone has has Justafixation #2? If so drop me a line in the comments (always welcomed). NExt post will be some Wall of Voodoo for a change. Yup… Something strange happened… the track list is scrambled. Somehow the song titles and artists names are attached to the wrong files. I'll fix it when I can… means a new archive. EDIT: The new Archive is linked now, with the correct bands tagged to the corresponding songs. err... the titles attached to the tracks are wrong... can you fix this?